It is a well established fact that the best-run businesses run SAP. For all its merits, SAP in itself is not a solution. 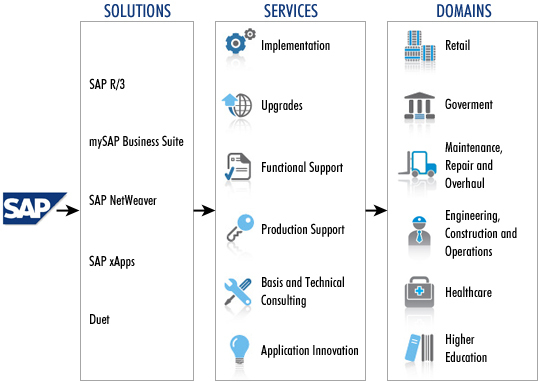 To truly benefit from SAP, you need the support of an expert who can make SAP work for you. Quintegra, with 13-plus years of experience in providing SAP services, is your ideal partner towards enhancing your profitability by leveraging SAP’s stellar capabilities with our unique value additions. The union of business and technology continues to change how companies operate, communicate, grow and profit. While the power of today’s integrated Enterprise Resource Planning (ERP) systems can deliver significant benefits, there are a number of factors to consider when planning, deploying and managing these solutions. There is a lot at stake, and little can be left to chance. Recent market consolidation has permanently altered the ERP landscape. Many companies who have made significant investments in HR, Financials or other ERP applications now find that those solutions will be dead-ended, and will need to migrate. In this time of uncertainty and doubt, companies need to assess their ERP application roadmap and determine the path which provides them with the best business value and least amount of risk. CIOs and other executives are being challenged to reduce information technology (IT) costs while simultaneously realizing more benefits from their SAP and IT investments. Lowering total cost of ownership (TCO) has thus become an even more strategic issue. As a value-based provider of end-to-end SAP services, Quintegra is uniquely qualified to help companies optimize, and potentially outsource, their non-core business systems and processes – helping to reduce TCO, and enabling the reallocation of resources and capital to focus on core business competencies. As a “one-source” partner, we offer a distinctive blend of best-in-class business and technology acumen, well-established IT leadership, plus global reach and stability. These capabilities, supported with a pool of dedicated SAP consultants, proven tools, methodologies, templates & accelerators and supported by a dedicated SAP Practice, are helping SAP clients across a range of industries around the globe achieve their tactical and strategic objectives in a way that affords greater value, lower costs and faster returns – all while mitigating risk. The SAP Practice at Quintegra has dedicated SAP consultants across the globe and has successfully completed several SAP implementations worldwide. With extensive experience operating across the globe and across industry verticals, Quintegra meets the demands of organizations of all sizes, ranging from small and midsize businesses to global enterprises. Quintegra helps businesses achieve competitive advantage by providing expert technology as well as domain experts for configuring, implementing & supporting SAP solutions that are aligned with industry best practices. Backed by an innovative and dynamic culture at Quintegra, a reliable management methodology for SAP, a Global Delivery Model for lowering TCO and SEI CMM assessed processes, Quintegra is uniquely placed to deliver nothing less than the very best for clients. Quintegra’s resources’ profound knowledge of key subject areas, based on experience and practical hands-on knowledge firmly sets them apart from the competition. Quintegra's SAP Practice has created a network of vibrant people with rich experience and stable processes that deliver solutions in the most optimal manner. We have an ideal mix of certified & richly experienced professionals in SD, MM, FI/CO, PP, QM, PM, PS & CRM modules. We provide delivery leadership and project management with a mix of PMP’s having multiple global projects handling experience. For an implementation to create competitive advantage for clients, it is imperative that the energetic teams of consultants specialize not only in the SAP application package, but that they also comprehend the unique complexities of clients’ businesses. Quintegra’s consultants have rich implementation experience at all levels and in diverse industry segments that synergize well both with the demands of the real-world business and the techno-functional capabilities of SAP. Zero entry cost SAP production and technical support services, delivered onsite or via our global offshore support centers. An ideal option to complement internal help desks. With Quintegra as your trusted partner, you can enhance your profitability & create shareholder value, optimize your investments in SAP and realize lower costs & higher ROI.